Unit 183 Spinnaker Building - Durban Point Waterfront Accommodation. The Spinnaker is situated directly across from Ushaka Marine World, famous for its Aquarium, Dolphinarium and Water Theme Park. Here you will also find some of Durban's finest restaurants, takeaways, pubs and shopping facilities. Enjoy an evening walk on the beachfront promenade with easy access to the best swimming beaches. 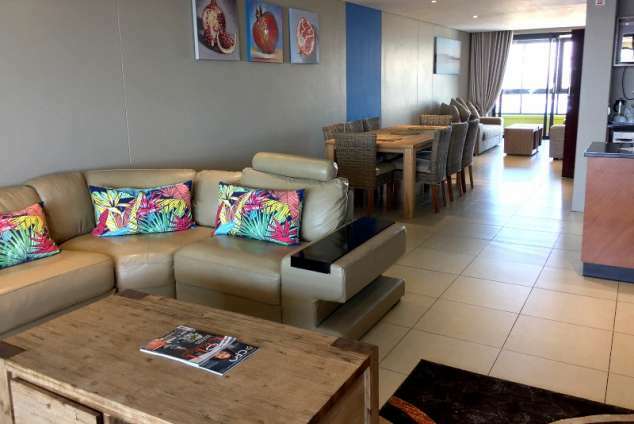 This 2 bedroom / 2 bathroom self-catering unit is situated on the 18th floor. The 2 x large patio's provide stunning sea and harbor views. Everything is made to make your stay comfortable, this apartment will make you feel like a home away from home. Ushaka Marine World (within walking distance). Suncoast Casino with movies and restaurants (less than 2km). Host of restaurants and pubs along the Marine Parade (less than 1km). Shopping / malls (less than 5km). Harbor cruise (less than 2km). Durban ICC (International Convention Center). Golf course (less than 3km). 1 King size bed in main bedroom. 1 Queen bed in second bedroom. Both bedrooms boast magnificent views. 2x comfortable sofa's in the second living area (serve as 2x single beds). Main bathroom en-suite, has tub and shower. Family bathroom has tub and shower. TV living area includes a smart tv with premium DSTV, Netflix, Youtube, etc.... unlimited Wi-Fi. This space opens onto large patio with stunning sea views while watching the ships entering the harbor. Second living area with couches to relax and read, a quite space that opens onto a smaller patio with an amazing view of the harbor. All linen and bath towels provided, beach towels are NOT provided. Kitchen fully equipped - has new appliances (fridge/freezer, oven & hob, microwave, dishwasher, clothes washer & dryer combo). All kitchen utensils provided, coffee plunger. The apartment is serviced after every booking, but cleaning during your stay can be arranged. Access into building and apartment wheelchair friendly. No stairs to climb, 2x lifts for easy access to apartment. 2075 page views since 26 Nov, 2018. Last updated on 17 Apr, 2019.